Scott’s Mexican Garter Snake (T. eques scotti, Conant, 2003) in the wild and in captivity. The Mexican Garter Snake (Thamnophis eques) is a relatively unknown member of the genus of Thamnophis, like other species from this genus that occur in Mexico. Most (English) literature is on Canadian and American Garter Snake species and especially the Northern populations of Thamnophis sirtalis are well studied. Also most species of Garter Snakes kept in captivity in and outside Europe originate from the United States of America and sometimes from Canada. 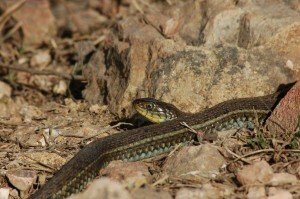 The Mexican Garter Snake occurs in a large part of Mexico but relict populations are found in the most northern part of their range in Arizona, USA and New Mexico, USA. 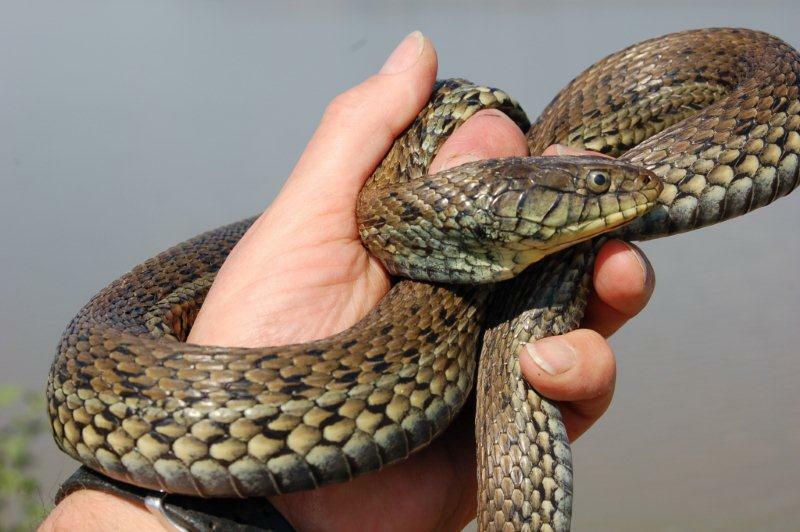 These populations in the US belong to the subspecies Thamnophis eques megalops and seem to be in jeopardy and some may be heading for extinction soon (Greenwald, D.N., 2003). Prior to 2003 only two other subspecies of Thamnophis eques, which are both endemic in Mexico, were known and mentioned in literature (Rossman, D.A., N.B.Ford & R.A.Siegel, 1996): T.e. eques and T.e.virgatenuis. It was with great excitement that we read the article written by the (late) famous herpetologist Roger Conant in 2003 (Conant, R., 2003) in which he describes 7 new subspecies of Thamnophis eques. In this article we want to introduce one of these newly described subspecies: Thamnophis eques scotti or Scott’s Mexican Garter Snake. We will describe its natural habitat plus some personal observations of T.e.scotti in the wild. Also we want to share our experience with keeping this magnificent Garter Snake in captivity. Thamnophis eques scotti is quite unique within the group of Thamnophis spp. He differs in many ways from the other members of the Thamnophis genus and many of its unique characters are hardly mentioned in literature. Part of its unique reproductive biology is mentioned by Rossman, D.A., N.B.Ford & R.A.Siegel (1996) but other aspects of its (reproductive) biology have not been mentioned: capacity to produce 2 litters a year, large size of offspring, extreme growth speed, early adolescence and very large size of the adults. These are typical aspects that one finds out by keeping and breeding snakes in captivity and making notes about its biology. In this way amateur herpetologists can make valuable contributions to science. Dorsally the snakes have a light coloration (yellow, light brown, pale green) and typical is their unusually wide middorsal stripe which can cover up to 7 scale rows. 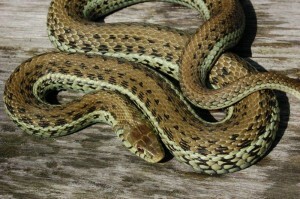 Conant (2003) called these snakes “blonde” in coloration. The yellowish or brownish-yellow middorsal stripe can have the same color as the remainder of the body so that it sometimes looks like the snakes are virtually stripe less. But in darker specimens the middorsal stripe is clearly visible. There is no black line bordering the middorsal stripe. The lateral stripes are more prominent and much lighter in color. They can be anywhere from white to yellow to greenish, sometimes almost bluish green. There are usually 2 rows of black spots between the rows which can vary in size and may be more or less inconspicuous. They can also be quit big and very prominent. The higher row of spots sometimes partially invade the dorsal stripe. The labials often have the same light color as the lateral stripe and are in contrast with the darker upper part of the head. The yellow labials have beautiful black sutures. Lower labials and chin also light colored, mostly yellow. Nuchal blotches often vague in the adults, but they can be quite prominent in the juveniles. Behind the head they have a light yellow ring in the neck, somewhat like the European Grass Snake (Natrix natrix). The 2 rows of scales below the lateral stripes are usually lighter colored then the dorsal scales. Belly is grayish-green and more or less without any pattern. Conant (2003) mentions the huge variability within this population as typical for this subspecies. 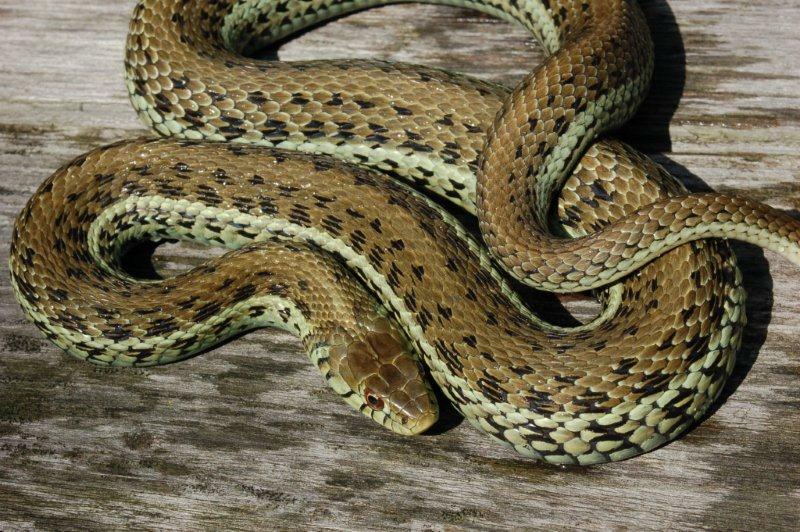 But in general this snake is unusually light colored in a unique way, very unlike any other species of garter snake. Thamnophis eques is one of the largest Garter Snake species and Conant (2003) mentions a new record total length for T.eques (obscurus) of 121,6 cm. Especially the females become fairly large and stout bodied. Older and other literature (almost exclusively based on the American populations of T.e.megalops state this is a “medium sized garter snake reaching one meter in total length” (Greenwald, D.N., 2003) or a “medium sized snake reaching a total length of 112 cm (Brennan, T.C. and A.T.Holycross, 2009). When we first encountered Thamnophis eques scotti in the wild we could not believe how huge most specimens where in Lago de Magdalena. The first author (S. Bol) found a huge old female that would have been 130,7 cm total length with a complete tail (part of the tail was missing). A new record for this species! 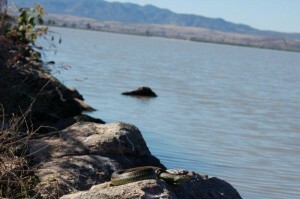 Scott’s Mexican Garter Snake is only known to occur in the Lake of Magdalena. 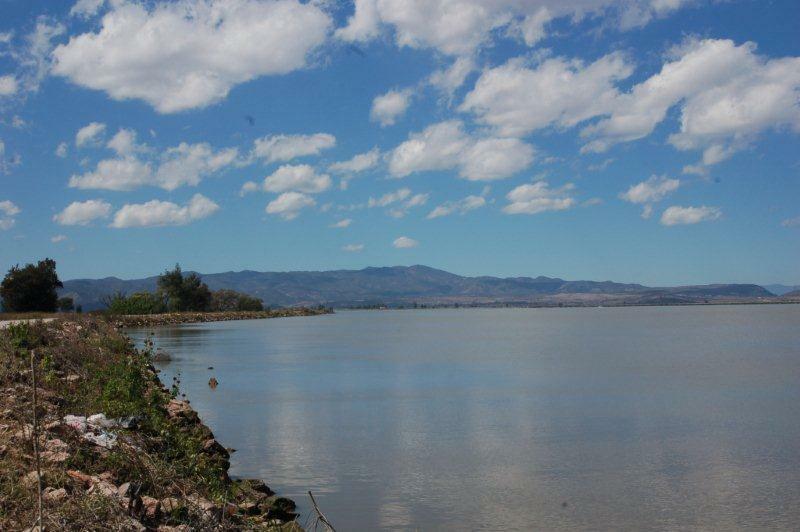 This endorheic lake is situated in the Mexican state Jalisco at 1380 meters above sea level. The current lake is only small compared to what it used to be long ago. There is some water in the surrounding area so it is not unlikely that T.e.scotti also occurs around Lago de Magdalena. Both authors did not visit any nearby potential habitats. The northern and eastern shores of the lake are very flat and consist of clay. There is hardly any vegetation, partly because it is a cow pasture. Shelter is hardly available. 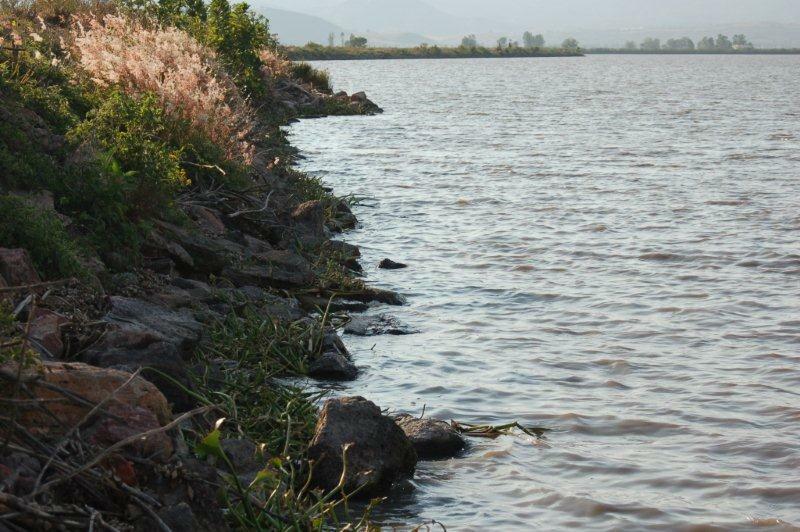 The southern and probably part of the western shores are formed by an embankment (which is also a dirt road) made of soil and (on the lake side) huge boulders. 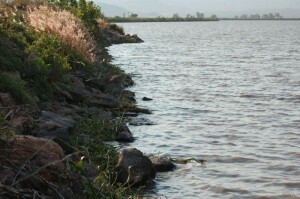 This embankment separates the lake from a large swampy area. In between the boulders there are plenty places for snakes to hide and all sort of vegetation and bushes are growing between the rocks. The snakes are highly concentrate in the embankment habitat. 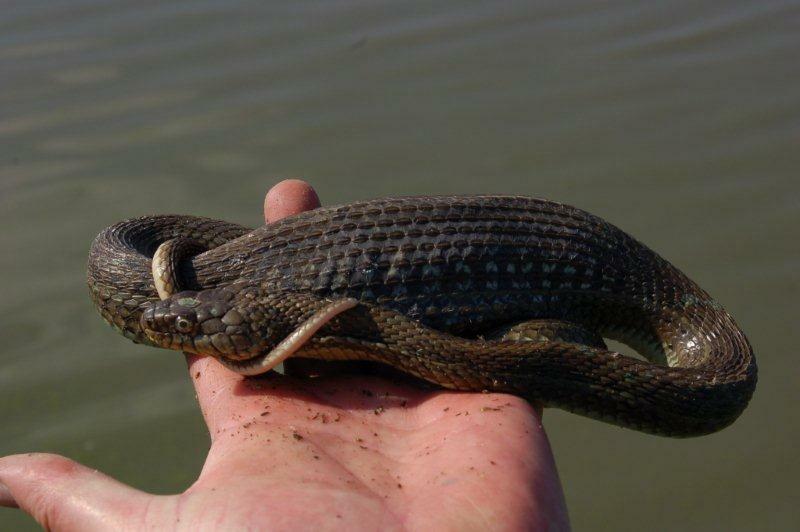 Both authors have not seen any snakes on the flat shores, but they also did not search much in that habitat. The lake probably will not be very deep, maybe 2 – 3 meters maximum depth. 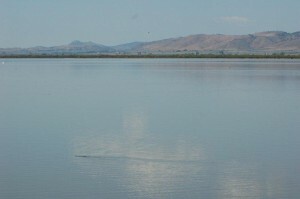 The lake is fed by rainfall, most of which falls between July and September. 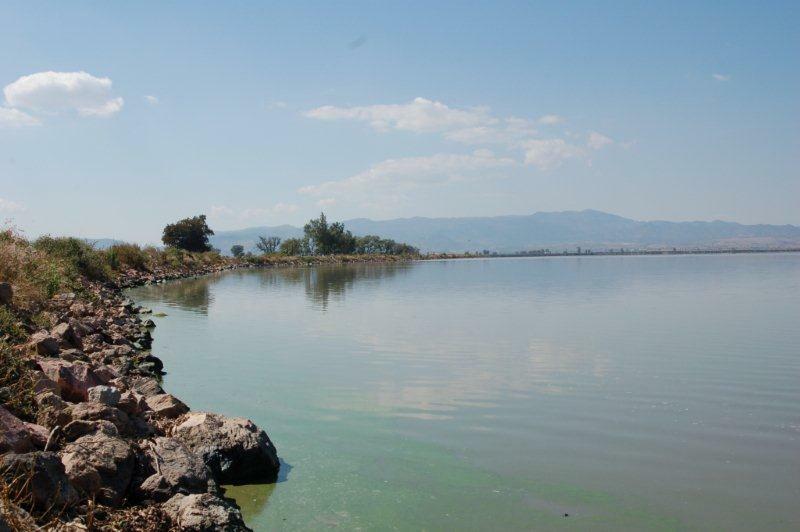 The water in the lake is not clear and has a muddy color and can be green from water algae. Water vegetation is not obvious. The lake will partly or completely dry up towards May – June (Bol, personal observations and Conant (2003)). August 3rd – 6th 2007 the second author (Bruchmann) visited Lago de Magdalena. August 3rd was a hot day with temperatures at 2 pm of 36,2 ºC. At 8 PM it was cloudy but temperatures were 25,9 ºC. No snakes were seen. The next day, August 4th 2007 the habitat was explored from 07.30 AM onwards. It had rained during the night. About 20 adult T.e.scotti were seen swimming in the lake close to the embankment. One large female (possibly pregnant) was seen high on the embankment. After 10 AM hardly any snake activity; it was probably too hot. No amphibians were seen but 2 frogs were heard calling in the nearby swamp. August 5th it was cloudy and windy. No snake activity. August 6th 2007 it rained again during the night. It was not as hot and it was cloudy. The habitat was explored from 07.30 onwards. The first adult scotti was seen at 08.30 AM high on the embankment. Eight others were seen swimming in the lake. The snakes made sure they swim around the observer, which means they have good eyesight. And which makes them very difficult to catch in the warm weather. At 10 AM temperature was 24,7 ºC in the air; water temperature measured 1 meter deep was 26,4 ºC. November 11th 2007 the first author (Bol) visited Lago de Magdalena. Night temperatures were around 5 -10 ºC, but daytime temperatures rose up to appr. 30 ºC (no exact measurements). The habitat was explored from 1 – 5.30 PM. Being in the habitat makes one realize that microhabitat, climate and behavior of the snakes are in a complex way interacting. The snakes probably prefer the embankment with large boulders and vegetation since it provides a safe place to bask; the open spaces between the large boulders provide ample hiding places and the vegetations helps to thermo regulate in a safe way. From the embankment they have a safe excess to the lake. The habitat on the embankment with the large boulders is on a steep sloop facing north. With the low November sun the boulders were in the shadow and still felt cold at 1PM. The only place where the snakes can bask to reach their preferred body temperature in this time of the year around 1 PM is on top of the embankment or in the lake floating on the water. In the first 30 minutes 3 snakes were seen basking high on the embankment. Two got away, but a third one was a large female of 91 cm total length (71cm snout-vent length (SVL) and 20 cm tail length (TL)). The snake had recently eaten a large fish. The first snake was observed swimming. It was a great challenge to catch the swimming snakes. In the next 30 minutes 3 huge females were caught; all more then 100 cm total length. All 3 were in the water. One of them had recently a fish. 1 of the females was extremely huge and thick. She was 100 cm SVL with a broken tail of 10 cm. With a relative tail length of 23,5 % (some females even have slightly longer tails) she would have measured approximately 130,7 cm. This is a new record for this species and subspecies. The old record was 121,6 cm for Thamnophis eques obscurus (Conant, 2003). Thamnophis eques scotti swims with it’s body floating on the water. Some snakes were observed swimming, other were floating on the water close to the embankment (close to the large boulders). Possibly this is a way for the snakes to thermo regulate in a safe way. Of course this needs confirmation via extra observations but basking on the water (other then on algae mats) has not been mentioned in literature about Garter Snakes. After 2.30 PM the sun started to shine on the lowest rocks near the water; higher on the embankment the boulders still felt very cold and were still in the shadow. Towards the end of the afternoon there was a bit more sun on the lowest rocks of the embankment, but at no time the sun was really strong on the embankment. Possibly this is the case in the early morning hours though. Anyway the snakes became very quick and agile between 3 and 4.30 PM and hence difficult to catch. A nice observation concerned a large specimen that was swimming in the lake around 5.15 PM. The wind started to catch up and temperatures started to drop. Obviously the snake did not notice the observer and returned to the embankment, crawled on one of the lower rocks and started to bask in order to catch the last rays of the sun that was dropping fast. Between 2.30 and 5.15 PM a total of 11 adults T.e.scotti were caught, of which 2 were males. The 2 males were 84 and 85 cm TL, the females measured 87 – 113 cm TL. Two of the snakes had recently eaten. Also 1 male Mexican Blackbelly Garter Snake (T.melanogaster canescens) was found. 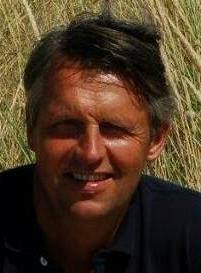 November 21st 2009 the first author (Bol) visited Lago de Magdalena again from 12.45 – 5.00 PM. Temperature was 25 °C upon arrival and the sun was shining. The snakes were very active. Approximately 70 different snakes were seen or heard. Approximately three T.m.canescens, but the majority was T.e.scotti. Most of them were sunning, a few were seen swimming. Several times this day 2 – 5 snakes were observed together, but since they were very agile and fast due to the high temperatures they more or less disappeared on sight. 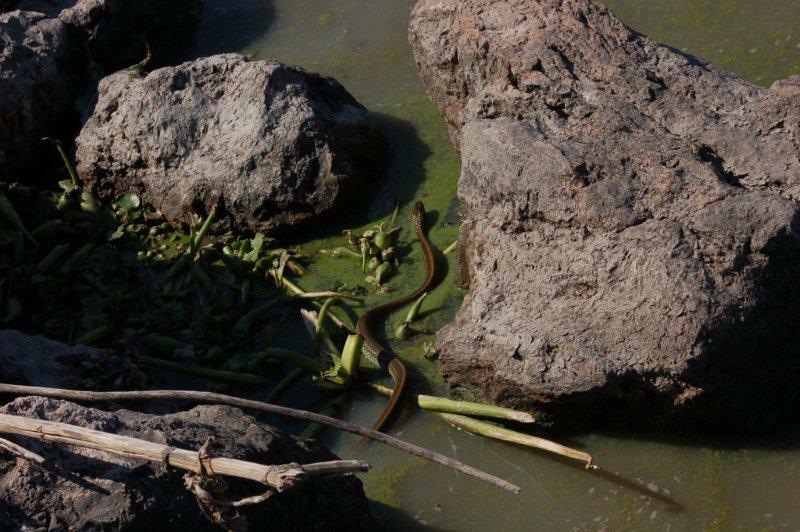 On one occasion 2 – 3 snakes disappeared down the embankment where they refrained from escaping into the water. Instead they were obviously searching and looking around (for a mate?) and 2 snakes climbed up the embankment again. One of the snakes that crawled up was caught and proved to be male. This typical behavior (males that do not try to escape after disturbance but quickly try to locate the female again) was also observed the same morning at Lago Chapala (Bol, 2010). Here a small mating ball of courting T.eques obscurus (4 males with 1 female) was found in a patch of reed. Because of the combined observations the first author (Bol) is convinced that also Thamnophis eques scotti was actively courting on November 21st 2009. January 30th 2010 the first author (Bol) visited Lago de Magdalena from 12.35 PM until 5.10 PM. It was a sunny day with shattered small clouds. Towards 5 PM the sun disappeared behind the clouds. 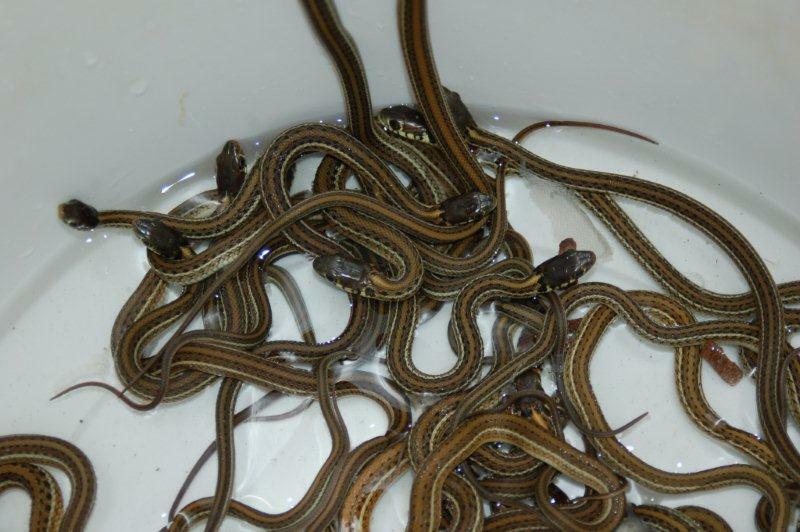 Maximum temperatures probably 27 – 29 ° C.
Like November 21st 2009 there was a lot of Garter Snake activity. In total approximately 45 – 50 snakes were seen. 5 of them were T.m.canescens, all sunning between the rocks close to the water. The majority were large T.e.scotti all basking in the warm January sun. Only 1 snake was seen swimming. Several snakes had recently eaten and looked well nourished. Some of the females were so thick that they seemed to be pregnant, although this could not be confirmed through palpation. Many recently shed skins could be found between the rocks, and some snakes were about to shed their skins. Some snakes were caught for measurements; 4 males of 71, 76, 96 and 102 cm total length; 3 females measured 93, 99,5 and 103 cm total length. I found 2 snakes (T.e.scotti) lying dead on the rocks. One small male scotti was severely injured but still looked surprisingly healthy. One very old female had a large scar on her back as large as a 1 euro coin. The last scotti was observed that day sunning at 5 PM. Our observations in August & November 2007, November 2009 and January 2010 show that Thamnophis eques scotti is still occurring in high quantities in the lake of Magdalena. The observations in August are in line with Conant’s observations (Conant, 2003). It is very likely that the snakes are active from August onwards well into November. Our observations in early and late November and in January suggest that Thamnophis eques scotti remains active throughout the winter. Perhaps activity slows down when the lake dries up in May or June. Since T.e.scotti is a large snake they require a large terrarium. Minimal size for a couple would probably be 80 x 50 x 50 cm (l x w x h) although a length of 100 – 150 cm is better. The first author (Bol) keeps T.e.scotti in well ventilated and complete dry terraria, made of glass or wood. The ground surface is covered with wood chips. Some stones and pieces of wood provide hiding places in combination with dead leaves. The water dish measures appr. 30 cm diameter and 10 cm high, which is just enough for the snakes to submerge. An interesting way to keep T.eques scotti is to keep them in a large aqua terrarium with a dry spot to bask and dry up. This would mimic their natural habitat where they swim long distances in the large lake of Magdalena. Bol has kept other subspecies of T.eques (obscurus, cuitzeoensis and insperatus) in a aquaterrarium with success. A regular lamp of 25 – 75 Watts provides light and heating. By choosing the wattage of the lamp I try to create locally temperatures of 28 – 32 °C. A branch close to the lamp gives the snakes the opportunity to regulate their body temperatures. Further away from the lamp the temperatures during the day can measure between 18 – 27 °C. The lamp is switched on during 12 – 16 hours per day. In some years the author has shortened the day length in winter time to 6-8 hours a day. During the night the temperatures drop to 20 – 25 °C in the summer and 8 – 16 °C in the winter. The terrarium of the second author (Bruchmann) is larger (120 x 50 x 50 cm). The ground surface is covered with black “potting soil”. Due to the large size of the terrarium 2 heating sources ( Osram lamps of 120 and 80 watts) are offered on both sides of the water dish (15 cm diameter). They are turned on 10 hours a day. In the winter 60 watt lamps are used which are turned on only 8 hours a day. Both authors do not really hibernate T.e.scotti, but have kept them warm throughout the winter in most years. Bol keeps his snakes in a unheated room in the attic. Night temperatures can drop to 8 – 12 °C in December and January during cold spells. So the snakes will notice it is winter. The snakes are not very active during the winter months and eat less frequently. Sometimes they refuse to eat for a few weeks (6 – 10 weeks) in a row. They do bask infrequently, sometimes only for a few hours per day. Other days they stay in their hiding places or they lay practically motionless for days or weeks in a row in the waterdish. Especially when temperatures are very low they retreat in the water. Bol has also offered both adults and babies in 2011 a short hibernation of 4 – 10 weeks. Some snakes remained in their terrariums at 10 – 15 °C, simply by keeping the lights switched off. The snakes can also handle such a short hibernation without problems. A few snakes were kept colder in small container with wet substrate and 100 % RH for 8 weeks at temperatures that dropped even as low as 2 °C. This is how Bol hibernates all his American and Canadian Garter Snake species. The snakes came out of this hibernation looking fit and healthy. Bruchmann simply lowers the wattage of the lamps in wintertime and shortens the time they are switched on. Our conclusion is that T.e.scotti does not need to be hibernated, and low night times during wintertime mimic the natural situation in Mexico. 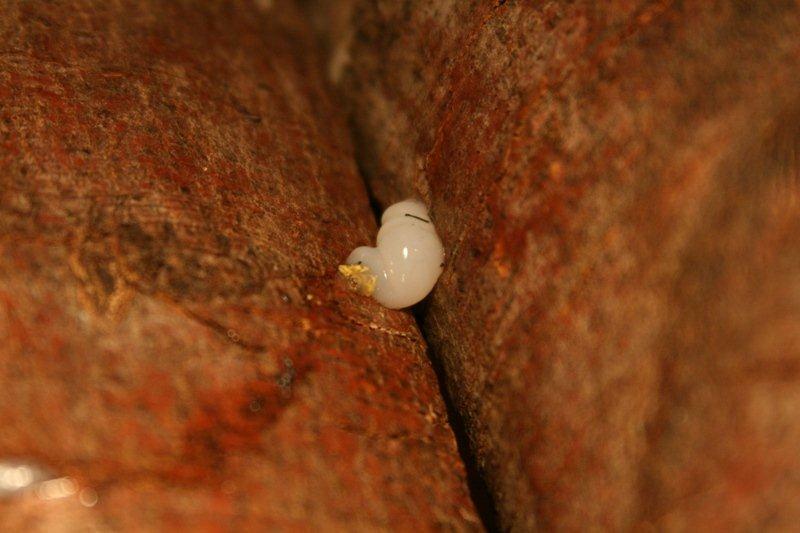 One can choose to hibernate T.e.scotti for a relatively short period without any problems though, and in Mexico cold spells of 1 – 2 weeks during wintertime will occur. Bol feeds the snakes outside the winter months every 5 – 7 days and he regularly skips 2 weeks. They are offered more then they can eat mostly early in the evening, and the remaining fish are removed the following morning. The snakes are offered various species of fish (smelt and Barbus spp.) on a small plastic dish which are defrosted before offering. To prevent Thiaminase (Vitamine B1 deficiency) several droplets of Vitamin B1 are sprinkled over the fish every time they are offered fish. Multivitamins (Nekton rep) are only offered in low quantities once every 4 – 8 weeks. No other supplements are added. Thamnophis eques scotti can also handle very large fish because of their large heads (especially the females), so every now and then I offer them large fish when I have them available (mostly local species like Scardinius erythrophthalmus and Rutilus rutilus). Bruchmann offers his snakes besides a variety of fish species (like Smelt, trout filet, eel perch) also baby mice and baby rats without hair. The baby rats form the biggest part of the diet, offered 2 – 3 times per week. From November-Februari Bruchmann only offers food every 2 weeks. They still accept (very low) amounts of food during winter time. The snakes differ a lot individually as far as behavior in captivity is concerned. The young babies tend to be quite shy in general. They like to hide under cover and disappear quickly when you enter the room. Bruchmann has a wildcaught male which has remained very aggressive and will bite when handled. Another captive bred male and the wildcaught female are quite shy but can be handled with quiet and slow movements. One captive bred female is very tame and can be handled without problems. Both the wildcaught as the captive bred adults of Bol are quite tame and can be handled without being bitten. Outside the winter the (sub)adults are usually clearly visible in the terrarium basking on a warm spot, and they do not disappear when one enters the room. T.e.cuitzeoensis (the subspecies occurring in Lago Cuitzeo) for instance is much more aggressive for instance and also remains more shy. There are several periods throughout the year that one can observe mating behavior. Bol keeps the snakes the whole year together (as long as they are allowed to produce offspring) and has witnessed most intensive mating behavior from October-February. After February the males become less interested in the females, since they are already pregnant. A second period of mating occurs just before and after the first young are born. This is around May, June, July and August. For instance on 9 May 2009 Bol observed mating behavior after several months of no interest in the females. On 27 May 2009 the young were born and the same day a coitus was observed. Bol observed coitus on 31 October 2008, 7 December 2008, 27 May 2009, 19 October 2009 and 10 November 2011. 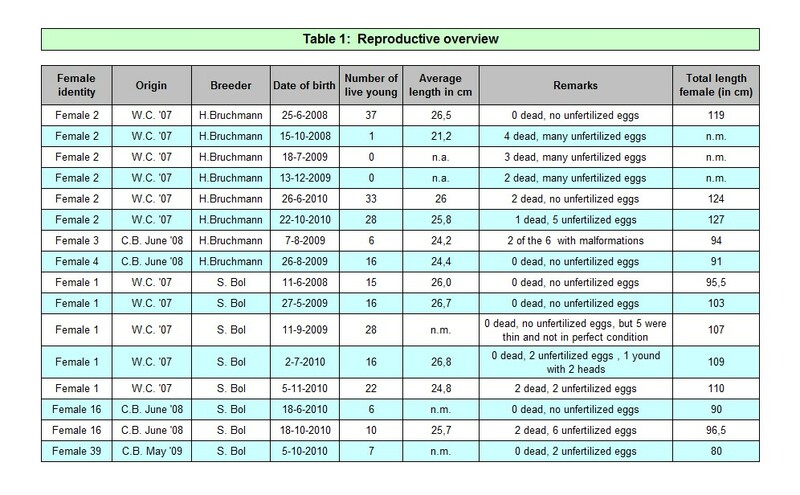 Bruchmann has noted the following dates: 22 October 2007, 17 December 2007, 27 August 2008, 1 July 2010. Bruchmann has timed one of the copulations at 150 minutes. A copulatory plug was observed; the female excreted it after 41 minutes. In table 1 the dates of births are noted. When you look at the dates for females 1 & 2 you can see that both snakes produced a first clutch between late May and early July for 3 years in a row. Thamnophis eques scotti is very capable of producing 2 clutches a year. The second clutch is produced in captivity between mid September and mid December. Female 2 produced 2 clutches in 2008, 2009 & 2010. Female 1 produced 2 clutches in 2009 & 2010 and female 16 produced 2 clutches in 2010. The number of offspring varied from 6 – 37. Of course the largest clutches are produced by the largest females. The young are already very large at birth. The average length of the young in one litter varied from 24,2 – 26,8 cm at birth (not taking the clutch with 1 live juvenile born 15 October 2008 into account). The smallest individual juvenile measured 20,5 cm ( a female), the largest one 30,1 cm (a male). 65 males measured on average 19,9 + 6,3 = 26,2 cm (TL = 24,0%); 54 females measured on average 19,4 + 5,9= 25,3 cm (TL = 23,3%). So the males are slightly larger at birth. Another fact worth mentioning is the fact that T.e.scotti can produce offspring at an age of little over a year (female 3 mentioned in table 1 was 13,5 month old when she gave birth for the 1st time, females 4 and 39 were a little older). The juveniles are separated from their parents after birth and put in a small terrarium in groups of 10 or more. In general they are very easy to raise. They accept dead fish or even baby mice (Bruchmann) very readily, and most juveniles start eating within 1 – 2 weeks after birth. They can grow up very fast, even on a diet of only fish fed once every 3 – 7 days. Of course growing speeds will even increase when they are fed baby mice or rats. One juvenile female bred and raised by Bruchmann reached the 94 cm after 13,5 months. One female bred and raised by Bol measured 95 cm after 15,5 month on a diet of fish only (the 15,5 month includes a hibernation of 4 weeks). A nice indirect example of the enormous growth speed one can find in the article about T.e.scotti from Di Giandomenico (2011), where he mentions that he could not believe his snakes acquired in 2010 could have been born in 2008. The growth speed of T.e.scotti is simply very exceptional for the genus of Thamnophis. With a maximum size of 130,7 cm in combination with its heavy weight Scott’s Mexican Garter Snake is one of the largest and heaviest of all Garter Snakes; only Thamnophis gigas is larger. Thamnophis sirtalis can also reach a similar length, but that is very exceptional and they remain much thinner. 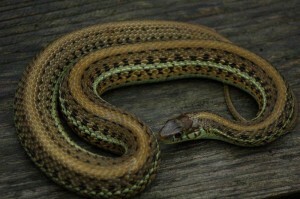 Their beautiful yellow-greenish colors and the wide mid-dorsal stripe makes it a very attractive and unique garter snake, and visually very different from any other species of Thamnophis. Thamnophis eques scotti is highly aquatic and can be kept in a regular garter snake terrarium but is also very suitable for a true aquaterrarium. T.e.scotti has the unique capacity to produce 2 litters a year. In literature multiple clutches are mentioned with other garter snake species, but this hardly ever is consistent and always when snakes are kept in a unnatural situation. Since T.e.scotti can do so in a consistent way when kept in a natural way both authors believe that this might also happen in nature. That would be unique for genus of Thamnophis. Other unique aspects are large size of offspring, extreme growth speed, early adolescence and very large size of the adults. These are typical aspects that one finds out by keeping and breeding snakes in captivity and making notes about its biology. In this way amateur herpetologists can make a valuable contribution to science. Brennan, T.C. & A.T.Holycross, 2009. A field guide to Amphibians and Reptiles in Arizona. Arizona Game and Fish department. Di Giandomenico, C., 2011. Erfahrungsbericht zur haltung von Thamnophis eques scotti (Conant 2003). The Garter Snake 16 (03): 9-18. Greenwald, D.N., 2003. Petition to list the Mexican Garter Snake, Thamnophis eques megalops, as an endangered or threatened species under the Endangered Species Act. Center for Biological Diversity Petitioner December 2003: 1-42.